2017 Kia Soul Pros and Cons: Why (Not) This Car? A cube isn't the most dynamic shape. But for 2017 Kia neverthless offers another 40 horsepower in its cube-car, the Soul, via a 201-horsepower turbocharged 1.6-liter engine and seven-speed DCT (dual-clutch automated manual transmission). Is the turbo Soul a mismatch, or a delightful combination of practicality and power? I spent a week with the 2017 Soul ! ("Exclaim," the trim level that has the new powertrain standard) to find out. With from 138 to 155 horsepower, the Honda HR-V, Mazda CX-3, and Chevrolet Trax don't pack nearly enough power to compete with the Soul Exclaim 1.6T. The 188-horsepower Nissan Juke can be fun to drive, but is far tighter inside than the Kia. The Fiat 500X crossover has been faring a little better than the 500L MPV, and it's offered with a 180-horsepower 2.4-liter engine, so it'll receive some attention here. Really, though, if you're seeking a performance-oriented small crossover there's one obvious choice, the Mini Countryman. As it happens, a fully redesigned Countryman recently reached dealers. The Mini is much more expensive than the Kia, especially if comparably equipped. But, even when fitted with a 201-horsepower engine, can the Kia Soul go tire-to-tire with BMW's British branch? We've got our comparison. Much more style than in the typical inexpensive car, but less than in the Mini. Better want black. Why the 2017 Kia Soul? Want the high seating position and excellent outward visibility of a crossover, but in a compact package? The Kia Soul provides. The 2014 redesign enhanced what was already a strength by employing more high-strength steel to make the A-pillars flanking the windshield nearly an inch thinner yet also stronger. The Soul's comfortable and well-bolstered seats are positioned at just the right height--no need to drop down or step up. You sit nearly as high in new Countryman, but the Mini's windshield, farther away and not as tall, noticeably constricts the view forward. Also, the Mini's instrument panel, deeper to begin with, appears much deeper because Mini's designers made no attempt to break up a vast expanse of dark gray. Why make the instrument cluster so compact only to bury it within a massive instrument panel? I vastly prefer the view forward from the Soul's driver seat. To get comfort and lateral support similar to that provided by the Soul's standard seats in the Mini, you need the sport seats standard on the Cooper S but optional on the regular Cooper. These are included in the Sport Package, which was on the tested Cooper. In its first applications, the Hyundai Veloster and Kia Forte SX, no one thought much of the Korean companies' 201-horsepower turbocharged 1.6-liter engine. Compared to the turbocharged 2.0-liter engines offered by Volkswagen and Ford in their hot hatches, the 1.6 lacks grunt and delivers quick but not quite thrilling acceleration. Put the same engine in the Kia Soul, though, and you have the quickest vehicle in its class. The Mazda CX-3, Honda HR-V, and Chevrolet Trax are all far less powerful. Jeep and Fiat offer a 180-horsepower 2.4-liter engine in the closely related Renegade and 500X, respectively, but even with nine transmission ratios to work with those vehicles still take about nine seconds to get from a stop to 60 mph. The Kia can achieve the same feat in under seven seconds, a dramatic difference. The Kia still isn't thrilling. Perhaps the turbo four goes about its business with too little fuss. Turning onto a busy street, you ask it to quickly get the car up to speed, and it obliges. Before you know it, you're there. No drama. If anything, the 1.6T engine shines brightest in typical daily driving, where it provides all the thrust you usually need with little apparent effort. Go light on the accelerator, and the transmission will shift at 2k. Go heavier, and it still will usually shift well short of the red line. The specs suggest why. While the non-turbo 2.0-liter engine in the Soul Plus (and in the Soul Exclaim until this year) can churn out 150 pound-feet of torque, it needs 4,700 rpm to do so. The 1.6T can not only twist its crank considerably harder--a max of 195 pound-feet--but can do this as low as 1,500 rpm. Acceleration is more of an experience in the Mini Countryman, even with the base Cooper's 134-horsepower / 162 pound-feet turbocharged 1.5-liter three-cylinder engine. The Mini's three sings a much lower, sportier tune than the Kia's four. It sounds like an engine twice its actual size. In typical driving the three feels plenty torquey. Its 1,250-rpm torque peak is even lower than the Kia's. Wind the three out, though, and you'll find it has no top end. If you want full-throttle acceleration like the Kia's, you'll need to step up to the 189-horsepower / 207 pound-feet Cooper S. The 2.0T Mini engine pulls more strongly than the 1.6T Kia engine, but it must motivate a heavier vehicle (by 276 pounds with FWD and 439 with AWD). While the Mini can seem quicker the stopwatch will report that they're closely matched. Any variety of Mini manages traction better than the Kia. With the Soul it's much easier to spin a front tire when accelerating while turning. Adding all-wheel-drive fully addresses this common issue with front-wheel-drive cars, but this option isn't offered on the Soul. The Mini's conventional automatic transmission (a six-speed in the base FWD Cooper, an eight-speed in the others) also performs much better than the Kia's dual-clutch automated manual. While the latter sort of gearbox adds to the driving experience in Volkswagens with lightning-quick shifts, the Korean execution leaves much to be desired. While upshifts with brisk acceleration tend to be quick and precise, in more casual driving the transmission often slurs shifts--once it decides to execute them. Especially at low speeds the delayed actions of the transmission often feel odd. But, hey, when you need the Soul ! to be quick it's quick! The second-generation Soul got much larger tail lamps. Too large? Controls are easy to find and operate, but look and feel pedestrian. Most people will probably prefer the exterior styling of the Countryman because it's, well, a Mini. If Minis weren't stylish then there wouldn't be much reason for them. But I'm personally not a fan of the wide bands of dark plastic around the wheel openings. These have the opposite effect of fitting a car with large wheels and low-profile tires. Visually, you can't fill the wheel openings of a Mini. I also don't care for the squared-off fender bulges on the new Countryman that appear cribbed from Bentley's new hyper-expensive SUV, the Bentayga (where I don't like them, either). These two quibbles noted, the Countryman does have a rounder, sleeker body and more athletic proportions than the taller, boxier Kia Soul. But I've long admired Kia's ability to take a basic box and add just enough of an angle to this line and that one such that the end result appears much more attractive than the relentlessly square Scion xB or the clumsily proportioned and odd-for-the-sake-of-being-odd Nissan cube. To signal the presence of the turbocharged engine in the 2017 Soul Exclaim, Kia added red highlights along the lower body and fitted 18-inch wheels with thinner, more delicate spokes. Both tweaks tastefully add a hint of sportiness. Kia sells a lot of Souls partly because it sells them cheaply. A base Soul lists for just $16,995, a low price for a car with so much passenger room. Step up to the Exclaim with the 1.6T engine, and the tally rises to $23,695, still quite reasonable when you consider the 201-horsepower engine and other added content. A Fiat 500X Trekking with 18-inch wheels lists for $24,825, about $1,000 more than the Soul Exclaim. Load both up (switching to the Lounge trim for the Fiat) and the difference remains about the same, $27,815 vs. $28,920, but some additional content on the 500X now accounts for about $750 of the difference. This is before discounts and incentives. Fiat has been struggling to sell the 500X, so its out-the-door price could be significantly lower. The price of the Mini ranges from quite a bit higher to way, way higher depending on how comparably you want to equip it. For typical around-town driving, the tested base Cooper performs nearly as well as the Soul Exclaim. Add a few things standard on the Soul--automatic transmission, partial leather sport buckets, 18-inch wheels, metallic paint--and the Mini's bottom line comes to $30,750, about $7,000 more than the Soul Exclaim. Feature differences account for about $2,200 of this difference. The big content difference: the Countryman has a standard panoramic sunroof. You can also get a panoramic sunroof on the Soul, but only if you also get a $3,000 option package (xenon headlights, nav, premium audio, forward collision warning, blind spot warning, lane departure warning, power seats, heated front and rear seats, heated steering wheel, a few other minor features), for a total increase of $4,000. Even if you add these options to the Kia a much more lightly optioned Mini is still about $3,000 more. Add all of the features included on a fully optioned $27,815 Soul Exclaim to the Cooper Countryman, and the Mini's sticker rises to $38,450. Whoa! The Mini so optioned unavoidably includes many features you cannot even get on the Soul. These include, but are not limited to: adaptive suspension dampers, adaptive cruise control, a parking guidance system, obstacle detection on both ends, knee airbags, a power liftgate, a head-up display (HUD), rain-sensing wipers, dual- rather than single-zone automatic climate control, rear seat air vents, a wireless charging station, memory for the driver seat, power 4-way lumbar adjusters for both front seats rather than 2-way for only the driver, and LED rather than xenon headlights. In the Kia's corner: blind spot warning with rear cross-traffic detection, lane departure warning, heated rear seats, and a heated steering wheel. These feature differences account for about $4,800 of the $10,635 price difference between the two loaded-up cars. So the Mini loses a little ground as options are added--unless the only thing you really want is a sunroof. The above price comparison was with the 134-horsepower Cooper. A 189-horsepower Cooper S lists for $33,200 with the initial group of options and for $39,950 with the second group of options. Put another way, if you want similar performance from the Mini, add another $1,500 to $1,950. Even after a sizable adjustment for its additional content the Cooper S Countryman checks in over (even well over) $5,000 higher than the Soul Exclaim. Like other Kias and Hyundais, the Soul has a 5/60 basic warranty and (for the original purchaser) a 10/100 powertrain warranty. Worth noting: Kia and Hyundai tend to interpret the coverage of their warranties more strictly than other auto makers do. Some items, such as interior trim, are warrantied for less than five years. Why Not the 2017 Kia Soul? As noted in the price analysis, you can get far more features on the Mini than you can on the Kia. You'll have to pay dearly for them, but at least Mini continues to offer options ? la carte, so you only have to pay for those you really want. With the Soul Exclaim, every factory-installed option except the sunroof is only offered as part of a single $3,000 option package. And if you want the sunroof you must also buy this package. The oddest omission from the Kia's options list: unlike with virtually every other small crossover, you cannot get a Soul with all-wheel-drive. This could prove a deal-killer for people who live in northern climes. Kia does offer the Sportage compact crossover with AWD. In terms of exterior dimensions and price, the Sportage is a size class up. But in terms of interior dimensions the two Kias are pretty close--the Soul is very roomy for a vehicle with a 101-inch wheelbase. Also, about the indecisive dual-clutch transmission: it's the only transmission offered with the turbo engine. I'd personally much prefer a manual transmission in the Soul Exclaim. But, unlike with the Mini, one isn't offered. The Soul's funky exterior works best with funky colors. While regular Souls can be painted "alien" green or one of two attractive blues, none of these colors are offered with the turbo engine. In fact, the only vivid color offered on the Soul Exclaim is a bright red that doesn't suit the car. The other choices are white, black, silver, and the dark gray of the tested car. Among these the dark gray works best. But, seriously, why aren't more and better (i.e. less serious) colors offered with the turbo engine? Inside the Soul, the color situation worsens. While orange stitching and houndstooth fabric successfully sportify the otherwise all-black interior, black should not be the only interior color option. How about something more cheery, Kia? You can do far more to customize both the exterior and the interior of the Mini. It's Mini's thing. Kia should do some cribbing here. Red lower body highlights and thin-spoked wheels indicate this is the new turbocharged Soul !. Plenty of room for heads and legs in back. Around town the Kia Soul rides pretty well for a car with a short wheelbase but not a short height. On the highway, though, the Soul's ride can become annoyingly bumpy. If much of your driving will be on the highway, be sure to test drive the Kia on the routes you frequent before buying one. I don't recall the 2014 Soul riding as bumpily. But I checked with Kia, and the suspension tuning hasn't changed. I must have driven less on the highway with the 2014. At all speeds the new Mini Countryman has a more polished, better controlled, less bumpy ride. Credit a far more sophisticated, fully independent rear suspension (the Soul has a simple twist-beam axle), four inches more wheelbase, a couple inches less height (61.3 vs. 63.5), a few hundred more pounds of curb weight (though the new Soul Exclaim isn't light at 3,232), and BMW's additional expertise with suspension tuning. Noise levels are moderate in both vehicles. Kia didn't upgrade or retune the Soul's suspension or steering to match the additional power of the 1.6T engine. Even left as-is, the suspension maintains a reasonably even keel in moderately hard cornering and the steering acts with an entertaining quickness. The Soul Exclaim might not feel sporty, but it does feel agile and well-behaved. The current Soul feels much more polished and composed than the 2010-2013 first generation car. Engaging sport mode firms up the steering a bit, but can also make the transmission hold lower gears, harming fuel economy. I'd like to be able to select the modes for the two systems separately. It's been a while since I drove the Fiat 500X. At the time, I noted polished handling sportier than that of the related Jeep Renegade but heavy, somewhat dull steering. As might be expected given the car's pedigree, the Mini Countryman handles curves more skillfully and with less lean than the Soul, and is generally more engaging. Sport mode affects the Mini's steering feel more, really tightening it up. The Sport Package, on the tested car, includes adaptive dampers. These can more tightly and precisely control body motions with little or no impact on ride quality, but they are not offered on the Kia. Tires, specifically the 225/50VR18 Eagle Sports included in the Cooper's Sport Package, seem to be the Mini's weakest link. Push the Countryman moderately hard into a tight turn and the front end scrubs toward the outside of the curve earlier than the crossover's chassis dynamics up to that point suggest it ought to. While such understeer is safe--to counteract it just ease up a bit on the throttle--it feels dull, and it sets in too early. I'd prefer sharper, more balanced handling closer to the Mini's limits when driving quickly along a curvy road. This was with the a three-cylinder all-wheel-drive Cooper Countryman. Stepping up to the Cooper S would add weight to the nose. Deleting AWD would remove weight from the tail. So the tested powertrain should yield the most balanced handling, and the others could be even more prone to understeer. This is all relative to some ideal. With more lean, less sporting suspension tuning, and less direct steering, the Soul can't compete in terms of driving enjoyment on a curvy road. While the Kia handles competently and pleasantly, and drives well when compared to other similarly priced compact crossovers, including the Fiat 500X, the Mini is more capable, more engaging, and simply more fun to drive. While auto makers increasingly fit their cars with downsized turbocharged engines to improve fuel economy, the Hyundai-Kia 1.6-liter engine hasn't been a star in this regard. In the Soul it does a bit better than in other applications, earning EPA ratings of 26 mpg city and 31 mpg highway, each one mpg higher than the non-turbo 2.0-liter in the Soul Plus. But Nissan does better with its turbo 1.6 in the competing Juke: 28/32. In four-cylinder Cooper S form, the Mini rates 23/32, so it's competitive on the highway but not in city driving. The three-cylinder Cooper roughly ties the Soul with 25/33, but it's much less powerful. In my real-world suburban driving the Soul's trip computer reported averages as high as 30 if I went easy on the accelerator and brake, but more typically mid-20s. On a 70-mph highway the car's height took its toll and the two-way average was only 27, a number bettered by many much larger, much more powerful sedans (if not by many crossovers). If you want stellar fuel economy in a small crossover, Kia recently launched the Niro hybrid. But, with about half as much power, the Niro isn't nearly as quick as the Soul Exclaim. while costing about the same (and thus about $2,000 more than the non-turbo but still quicker Soul Plus). No tradeoffs escaped here. The Kia Soul is quite roomy for a vehicle with such a compact footprint. A couple of adults can easily fit in the rear seat (where they'll find much more headroom than in a conventional sedan or hatchback). They'll also be comfortable, as the rear seat cushion is mounted well off the floor. While the Countryman is the roomiest Mini, and has four more inches of wheelbase to work with than the Soul, compared to the Kia it has about two inches less room for both heads and legs in back. There's still enough space for a couple of adults as long as they're not very tall. Plus, unlike the Kia's, the Countryman's rear seat passengers can recline and enjoy the cooling benefits of rear console air vents. The magic of the Soul's packaging has its limits. The rear seat can only be so roomy for a car the Soul's length because there isn't much more car behind it. There's just enough space behind the rear seat for my typical weekly grocery-and-Costco run. Even the average compact hatchback can hold more stuff back there. The Mini's longer wheelbase gives it an advantage here that's not reflected in the official specs: according to my tape measure the Countryman's cargo floor is about four inches longer. I have not measured the 500X, but the Jeep Renegade's cargo floor falls between the Kia's and the Mini's in length. In the Soul's defense, there's a fairly large well beneath the cargo floor. And the rear seat can, of course, fold. In some small crossovers, including the Fiat 500X, it's also possible to fold the front passenger seat, but not in the Soul or the Mini. For a relatively inexpensive car, the Kia Soul has a solid, nicely finished interior. Unusual for a car with a starting price well below $20,000, the instrument panel and the door panels are mostly composed of soft-touch materials. In the past, Minis have seemed much cheaper inside than their semi-premium pricing suggested they ought to have. The interior of the new Countryman, like that of the second-gen Clubman, is a big step up from that of its predecessor. Unlike in the past, the materials and build quality roughly befit the car's price. They're a little better than those in the Kia, as they should be given the price difference between the two. Compared to those in the Kia, the Countryman's knobs and switches in particular have a more upscale look and feel. 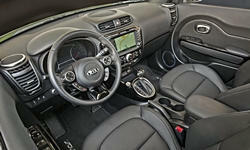 The Kia's controls don't so much look cheap as boringly pedestrian. They don't do anything to make the driving experience special the way the Mini's do. The Mini might have its largest advantage in the time-honored door-shut test. The Countryman's door latches shut with a fair amount of the solid, reassuring "bank vault" sound and feel that has sold many German-engineered cars. While the Soul's doors don't sound or feel tinny or flimsy when pulled shut, they don't stand out to the positive side in this area the way the Mini's do, either. Overall, while the materials and build quality of the Soul are very good for a car in its price range, those of the more expensive Countryman are better. 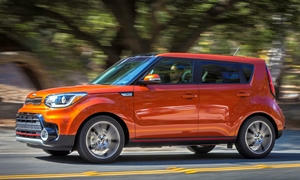 I wondered whether the new turbocharged engine would somehow make the Kia Soul Exclaim a blast to drive. It doesn't. The Mini Countryman helps earn its significant price premium by being more athletic and fun. On the other hand, the Soul Exclaim retains the strengths of the regular Soul, so it's roomier and provides a much more open view from the driver seat than the Countryman. Handling might not be as sporty as the Mini's, but in typical around-town driving the Soul feels responsive and well-behaved. It's a very pleasant car to drive (except for some bumpiness at highway speeds). Plus, while the color choices need work, the Kia has a distinctive style all its own. It might not be as flashy as a Mini, but it's not just another transportation appliance, either. To this package the turbocharged engine adds stress-free around-town performance. No need to worry about getting up to speed quickly enough when pulling out onto a busy road. The 1.6T engine produces so much torque at low rpm that in typical daily driving it barely has to rev. Plus, aided by efficient if not always slick DCT, it gets slightly better fuel economy than the less powerful non-turbo engine. In sum, unless you require a manual transmission, all-wheel-drive, or the sportiest handling, there's little not to like here, and quite a bit to like. The Kia Soul has been outselling all of its direct competitors because it's all the car most people need, with a dash of style, at an affordable price. The turbo engine might not transform the Soul into a Mini beater, but it does make an already very appealing package even more appealing. Very good if not great performance and fuel economy from the turbocharged 1.6-liter engine. Merely adequate cargo space behind the back seat. Additional space beneath the floor, though. Kia provided an insured Soul for a week with a tank of gas. Richard Martinelli of Motor City Mini (248-204-4613) helpfullly provided a new Countryman for a comparison test drive. 2017 Kia Soul pros and cons, according to Michael Karesh: the best reasons for buying (or not buying) the 2017 Kia Soul. Join TrueDelta to post your own impressions. Our 2012 ! has been a trouble-free pleasure to own and drive over 50,000+ miles. It seems that the new turbo engine perfectly addresses the only real criticism that I could level at ours - the 2.0L engine is adequately powerful, but doesn't sound great when revved, so we don't! The fact that the turbo's fuel mileage is better is icing on the cake. It's not hard to understand why the Soul has proven so popular. I rented a Kia Soul (normally asperated) and the first thing I noticed was the ease of getting in and out of the the car (ingress egress) which alongwith the eleated seating makes for a great city car. Its not a GTI, but an inexpensive fun option. Nice recap, and thanks for posting. You're comparing to the MINI Countryman throughout, but in a couple of places, you reference the MINI Clubman, of course a different vehicle. Was this intentional? Thanks again. Thanks for the note. In one place it was supposed to say Clubman, but in the other two that was a typo, now fixed.